I recently had the incredible opportunity to visit The George Dickel Distillery in Cascade Hollow, TN and taste their full range of whiskies with distiller Allisa Henley. I have lots to share about the distillery, the processes and the whole experience, but that will come in a later post. This post is a quick overview of their whiskies. Some points to think about as you read through this. First, Dickel produces five Tennessee whiskies and one rye. All five of the TN whisky varieties use the exact same mash bill, follow the same distillation and mellowing process, and are aged in the same barrels in the same warehouses. The only differences are their age, the blending and, in the case of the hand selected barrel, where the barrel aged in the warehouse plays a part. The similarities between the whiskies give you a unique opportunity to really taste the impact that the barrel aging imparts on the whisky over the years. Second, the whisky recipes (No. 1, 8 and 12) do not dictate the age of the whisky. While there are typical ages that comprise each recipe, the recipe is actually better thought of as the flavor profile that is produced. And, while we’re talking about the numbers, no one really knows where the No. 8 and No. 12 names actually came from. Any written history of where that naming convention originated has been lost to the sands of time. Okay, enough rambling, whisky time. Recipe No. 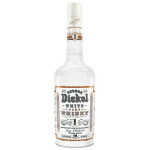 1 is Dickel’s unaged white whisky (white dog if you like). Though, as I mentioned, it does go through the same charcoal mellowing as all of Dickel’s other whiskies. The aroma is dead on buttered popcorn. It’s really uncanny how much the aroma of butter comes through. The grain aromas and flavors are very pronounced and there is a notable corn sweetness. The whisky itself is very smooth given its proof and the burn I’d expect from an unaged whisky is only a passing trace. I’ve always had some trouble tasting (and enjoying) white whiskies. But, while tasting No. 1 with Allisa, she mentioned something that really rings true. You have to taste and think about white whisky not in comparison to other whiskies, but rather in comparison to other clear spirits (namely vodka). If you put yourself in that mindset, it all makes a heck of a lot more sense. And for me, the cocktail ideas all seemed more logical. Recipe No. 8 is aged 5-7 years and the character still carries a lot of the grain notes that the No. 1 started with, but adds classic barrel aged flavors and aromas. With the grain notes you still get the hints of buttered popcorn and subtle sweetness. Layered on top of those are flavors of light maple, oak, caramel and vanilla and the lightest hint of smoke. The caramel and vanilla, while present, are still background elements at this age. There is a definite boldness to this whisky that more years in the barrel begins to tame. Recipe No. 12 spends 7-9 years in the barrel and this is where you can really start to note the huge changes that the barrel makes in that 2 year difference from the No. 8. In the No. 8, the caramel and vanilla notes were there, but really more background flavors. In the No. 12, caramel and vanilla are front and center backed by leather and tobacco flavors. The grain and corn flavors, while still present are also far more muted. 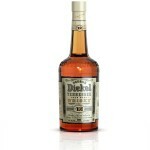 Allisa mentioned that Dickel fans typically fall into one of two camps. They either drink the No. 8 or the No. 12 almost exclusively. Sampling the two whiskies side by side you can really see (or should I say taste) why. Despite their same lineage, these whiskies have vastly different personalities. No. 8 speaks more of the grains and No. 12 of the barrel. It’s like two siblings. You can see the resemblance, note the characteristics that tell you they’re definitely related, but then their unique personalities set them apart. 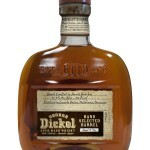 Dickel Barrel Select is a small batch blend of 10 barrels hand selected and blended to reach the flavor profile desired. Allisa’s quote about the Barrel Select really summed it up perfectly. “So smooth it’s scary.” The additional age for the Barrel Select has turned the bold No. 12 into a sipping whisky that really could be dangerous. It goes down easy and before long you realize your glass is empty but you’re left wanting more. The flavor continues the caramel and vanilla profile that was so bold in the No. 12 and adds a layer of Christmas spices and rolls it all up in fantastic smoothness. Dickel’s hand selected barrel program lets outlets go through the process of selecting a single barrel of Dickel that possesses the exact qualities they’re looking for. We tasted a 9 year old version (which is also what I received a few months back). Although, I have heard tell of some 14 year old bottles out there (let the search begin)! The flavor difference between the Barrel Select and the Hand Selected Barrel is striking. The Hand Selected Barrel that we tasted was far bolder than the Barrel Select and had a much fruitier quality to it. I should note that the Hand Selected Barrel was also at 51.5% ABV. With this particular selection sitting right at the high age point for the No. 12 you also get a lot more of the bold caramel and vanilla. George Dickel partners with MGP out of Indiana for the production of their rye for reasons that were both unknown and unexpected for me. We asked Allisa if they had considered distilling their own rye base spirit and she said that they had tried it. The problem is when you distill rye it is very foamy and comparatively sticky. So, in order to transition between rye and their normal mash bill they have to shut down production completely, clean everything from top to bottom and then restart normal production. When you read the next blog installment about their distillery it will make a lot more sense why the logical move is to partner with a distillery that specializes in rye. 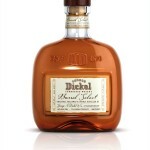 Allisa also added that the MGP folks are meticulous about the production and Dickel can dictate exactly what they want from start to finish. 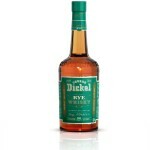 And, what Dickel wants is a 95% Rye, 5% Malted Barley rye whisky that is aged for 5-6 years. Keeping true to their tradition, Dickel then charcoal mellows the rye in the same process used for their Tennessee whisky before bottling. Dickel rye is the only rye that goes through the charcoal mellowing process and you can taste the difference. The classic rye spiciness is toned down a bit and the mellowing gives the whisky a very smooth quality that’s rare in rye whiskies. There are hints of maple, christmas spices and subtle vanilla sweetness. 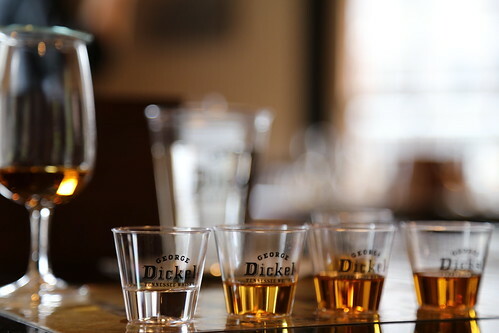 If you ever get the chance to taste the full Dickel line-up in one sitting, you definitely should. It’s a similar experience to a wine flight. You really get a sense for what time in the barrel does for the whisky and why spirits are aged for the times that they are.